Kentucky Turtles – slowly walking towards extinction? Turtles are one of the more likely species to be encountered in the wild. They are slow moving and seemingly friendly. This makes them both wonderful for a chance encounter with wildlife and also makes them prone to human interference. In Kentucky, the Kentucky Department of Fish and Wildlife monitors 6 turtle species (out of a total of 14) for conservation issues. Three of these—the alligator snapping turtle, midland smooth soft-shell, and southern painted turtle—are listed as either threatened or special concern by Kentucky's Comprehensive Wildlife Conservation Strategy (KSNPC). Three additional turtles (false map turtle, Mississippi map turtle, and mud turtle) have been added as Comprehensive Wildlife Conservation Strategy (CWCS) species for conservation reasons. This means that KYFW has reasons to believe that their population is rapidly declining and they may need intervention. Most turtle conservation areas are located in Western Kentucky. Turtles are scavengers and an important part of the Eco-system. They eat dead fish in ponds and rivers. Think how smelly it would be without turtles! 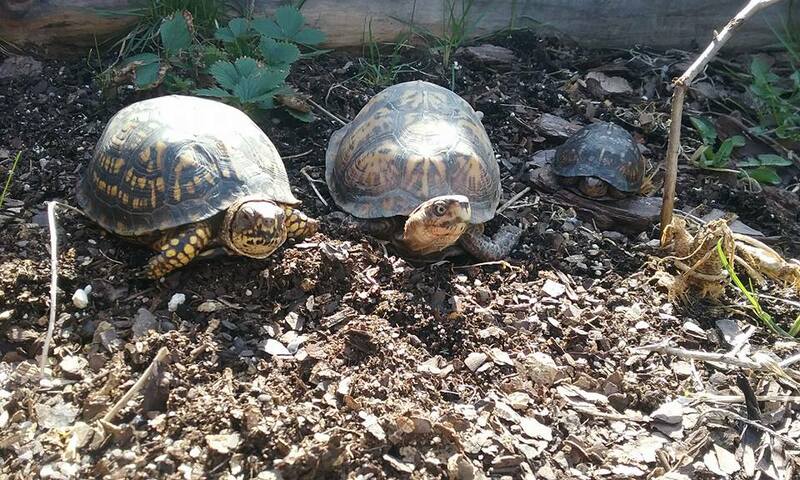 At Fox Run EEC we take in 10 – 15 turtles a year. Typically these turtles have been run over on the road by cars. Occasionally, we see one hit by a mower and once we had one who had fallen into a cement slurry mix at a construction site. Sadly, that turtle died from the toxins in the cement. One of our rehabilitation turtles getting glued up! For turtles with broken shells, we typically glue these back together. In some cases, we use pins to better hold the shell pieces(like a cast) together for healing. Turtles, being reptiles, do heal more slowly than mammals. Box turtles with mild cases are often able to be released the same season. Turtles do have a central nervous system and do feel pain. There is not a lot of research on appropriate pain medicines for turtles. However, we do give pain meds and hope that they are providing some relief. By becoming a member you can help us save turtles and expand our reptile rescue. The Eastern Box Turtle is often considered a common turtle in Kentucky and the turtle we most see in wildlife rehabilitation. But did you know that the box turtle is actually threatened in many states? They are considered vulnerable in Kentucky. Habitat loss, expanding development, the pet trade and removal by well-meaning citizens are all contributing to their demise. Turtles have a homing instinct which you can read more about in our blog There Is No Place Like Home. Government officials are recognizing that the eastern box turtle population is declining and it is now listed as a threatened species by the Convention of International Trade in Endangered Species (CITES). 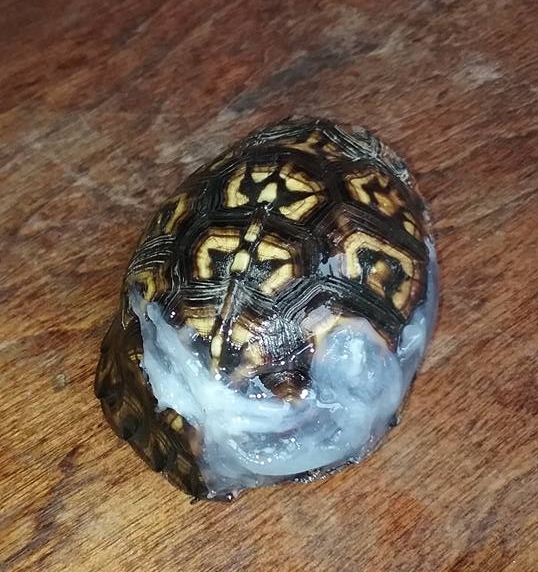 This is to prevent box turtles from being sold in pet shops. In addition, they are protected under the IUCN (International Union for Conservation of Nature). So, I’m going to have just a little bit of a rant. I have a hard time understanding why people want to remove an animal, in this case, turtles, from its natural habitat and enclose it for there own “enjoyment”. I have had many people argue with me that the habitat they provide (usually a ten-gallon aquarium) is better. When you remove a healthy animal from nature you are deliberately taking away its freedom, its ability to pursue its life as God intended and its ability to mate and increase the species. Yes, it may be safer but is that better? If you must have a turtle consider adopting a legal species and then take the time to learn how big they get. If you follow our Facebook page you have seen the African Spurred Tortoises that have been found on roads by my Fish and Wildlife officers. Their owners did not plan ahead and simply dumped them because they became too big and harder to care for. Damien of Arrowhead Reptile Rescue tells me that these tortoises have a very high abandonment rate. 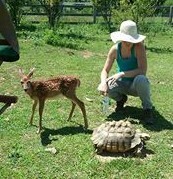 Intern Jessie with an abandoned African Spurred Tortoise and one of our fawn rescues. Note the pyramiding of the shell. These bumps are caused by poor care. Tortoises have very specific care needs such as humidity and temperature requirements. Box turtles are fascinating animals and have been on earth since the Pliocene period. The oldest box turtle in America was found in Nebraska and dates back to the Miocene era some 5 million years ago. 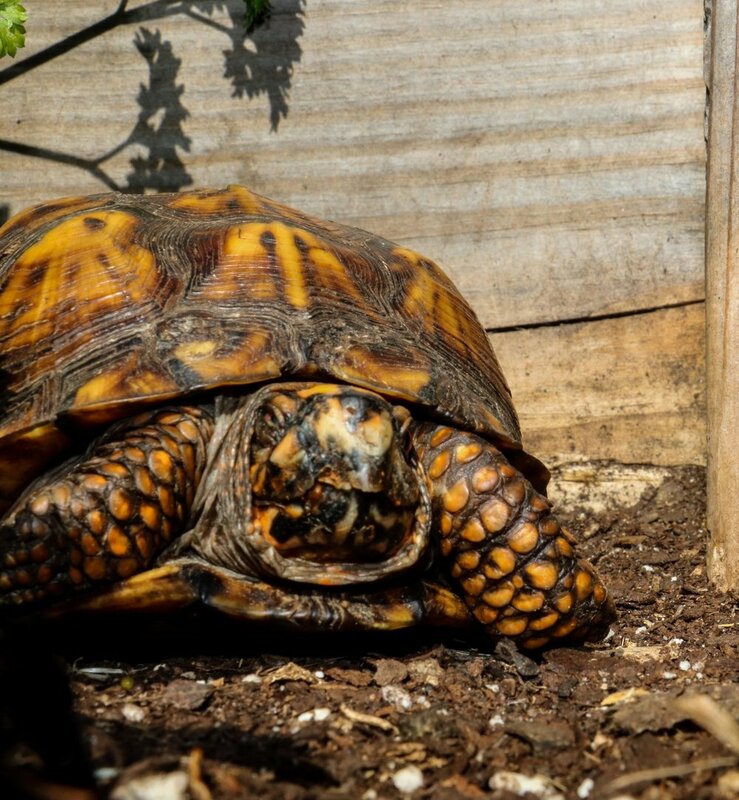 “Most box turtles spend their entire lives – which can exceed 100 years! – within 250 yards of the nests where they were born”. This means that if a development or road expansion occurs the turtle is not able to readily move and adapt to a new area. Studies have shown that box turtles have an internal map in their brain of their home range. If you relocate a turtle you may cause it confusion and it will only try to find its way home. Tracking studies have shown that relocated turtles sometimes die from stress and inability to adapt. Box turtles help with seed dispersal. For instance, wild strawberries are a favorite of the eastern box turtle. The seeds are not digested and are defecated up to a mile from where they were eaten, thus spreading the strawberry. 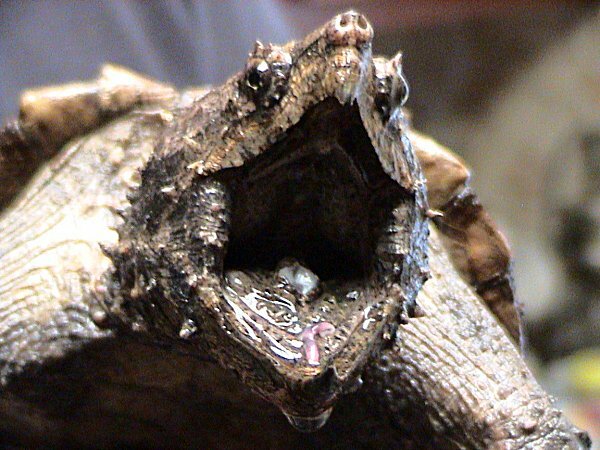 The Alligator Snapping turtle is rare in Kentucky and found in limited areas in Western Kentucky near the Mississippi River. Six Kentucky counties (Ballard, Caldwell, Calloway, Carlisle, Livingston, and McCracken) have confirmed sightings. This turtle has declined due to commercial harvest for human consumption, and general habitat destruction that has adversely impacted them throughout its range Alligator snapping turtle may not be harvested in Kentucky. Common Snapping turtles and many species of softshell turtles may be harvested for meat but may not be taken for sales purposes. · They have a vermiform appendage. This fascinating adaptation is simply a red worm-like body part that wiggles around in the mouth luring in prey. The False Map Turtle lives predominately in Western Kentucky along the Mississippi River watershed. They also live in ponds and lakes with the most viable population in Fulton County. They have been found on a few occasions in lakes and ponds in central Kentucky. False Map Turtles are more communal then many turtle species. They often live together, basking on logs and alerting each other to danger. They are a species in decline. A study conducted in 1999 found only 1.43 per 100 meters. The False Map Turtle typically on beaches and sandbars along rivers and lakes. Human disturbance and periodic summer flooding of beach and sandbar nesting habitat are major problems according to the KYFW. Drainage of wetlands for development has also been a primary concern. · False map turtles use touch and body language (postures and movements) to communicate. · During courting rituals, the male uses his fore-claws to drum over his potential mate’s eyes. · Nicknamed the “sawback” turtle because their lower carapace has serrated spines. Sadly, it’s not just an issue in Kentucky. Turtles world wide are in decline. Out of a total of 356 turtle species 61% of those are either already extinct or on their way. Turtles are the most threatened vertebrate group. World wide decline is due to the same reasons as we experience in Kentucky - habitat loss, the pet trade and climate change. The poor turtle, it is slow to adapt and change and this also makes it vulnerable. “They outlasted the dinosaurs, but no turtle has time to evolve to avoid being killed on a road, says Whit Gibbons, emeritus professor of ecology at University of Georgia and co-author of the turtle study” . Newer PostOpossums: Kentucky's Only Stunning Marsupial!